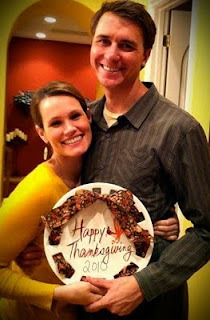 Well, our first Thanksgiving together was full of things to be thankful for! I might write a whole blog on this alone. Tonight I just wanted to mention that wonderful things are happening this week in the work department. Dan got a new job! I am so excited for him and so proud of him. He can tell you more about it, I don't want to post details on the internet but I have such good feelings about this position, I really think he is going to shine and it's going to be a great fit. Hooray for Daniel! And an anecdote from my work: A little taste of what it will feel like to change my name. After a few years worth of hand-written notes, I recently ran out of my little "From the desk of..." notepads. They only come in boxes of 12 notepads, so when it was time to re-order I was concerned because my name will be changing in March and I dislike wasting things. Lucky for me our print shop was able to split the order and get two of them with my current name to last me until next Spring, and the other ten have my soon-to-be married name on them! It is so tempting to use them but I keep them safely locked away in a drawer... I did bring one home to take a picture of it, here's a sneak peak... I think my new name looks pretty good! It is a beautiful name. Something about reading lots of these posts at once, catching up, is that I am remembering my romance w/ Franklin early on. I remember this kind of excitement!!! Heres the key, when I married him he was actually BETTER than I thought he would be. Such a nice surprise.